By now we’ve all heard about the film, “Five Broken Cameras” – the engaging story of Palestinian cameraman, Emad Burnat, who documented 6 years of the Non-violent resistance movement in his village, Bil’in. The film was screened for Israeli youth recently, and their responses were captured on video: “Five Broken Cameras” screened to Israeli youth (08:46). Your faith in humanity will be renewed by these young Jews. It is recommended that you watch the video full screen, because you’ll need English subtitles. See my note of thanks to Ann pasted below. If you’d like to watch an except from the documentary, ‘Five Broken Cameras’, click here. Tags: Bil'in, israel and palestine, israel and palestine conflict, jews. Filed under Israel and Palestine, israel and palestine conflict by Father Dave on Jan 31st, 2013. Comment. Is the Israeli government really sterilising Ethiopian women? I find this report hard to digest and I sincerely hope that it is false or at least exaggerated! It reads like something out of an Orwellian novel! Even so, the UK’s ‘Independent’ is a serious publication and the journalist seems to have done his research. If the Israeli government has really been involved in a program of forced sterilisation of members of its immigrant community, this is as sickening as it is criminal and highlights a deeply racist agenda on the part of those responsible. Let’s give this one some time. Perhaps more facts will surface? I find it hard to believe that any government in the 21st century could be sterilising sections of its population on the basis of their ethnicity! God help us! Filed under Israel and Palestine, israel and palestine articles by Father Dave on Jan 30th, 2013. Comment. 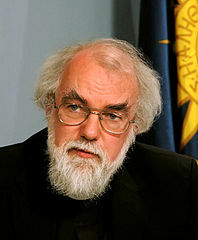 Rowan Williams, the 104th Archbishop of Canterbury, has stepped down from his post (sigh of relief). Williams’s role as a figure of unity in the worldwide Anglican Communion, which is represented in over 130 countries, meant that he was in a position to “bring the needs and voices of those fighting poverty, disease and the effects of conflict to the attention of national and international policy makers and donor agencies”. Or so we were told. In 2010, when the archbishop announced he was planning a visit to Gaza just a year after the slaughter and devastation of Operation Cast Lead, I asked his Lambeth Palace office for more information. Whom would he meet? Would he see the health minister? Would he sit down and talk with the elected prime minister, Ismail Haniyeh, man of God to man of God (for Mr Haniyeh is an imam)? Would he do Gaza (and all of us) proud by spending a generous amount of his time with senior members of the Islamic faith? According to the Archbishop’s website he did none of those things. At least, he didn’t mention them if he did. Unless I’m mistaken, he said nothing about Gaza in the House of Lords, where he had the ear of Parliament and the support of 25 other Church of England bishops. A lady wrote to me saying she had emailed Lambeth Palace 18 times asking if the archbishop’s party could please bring back some deaf children’s art, which should have been picked up by members of a recent Gaza blockade-busting convoy. The palace eventually declined saying the Israelis wouldn’t allow it. If he’d been “witnessing boldly” as he exhorted other Christians to do, the archbishop would surely have instructed his staff to pick up the children’s art and dare the Israelis to confiscate it. It was later revealed that the Israelis severely restricted the archbishop’s time inside Gaza. I asked why such interference with the church’s pastoral business in the Holy Land, of all places, wasn’t broadcast on the website, in mainstream media and in Parliament. His office confirmed that the archbishop had initially been refused access to Gaza but was eventually permitted one-and-a-half hours. This was just enough for a hurried visit to the Ahli hospital and no more. When my questions were forwarded to the archbishop’s public affairs spokesman, the reply was headed “NOT FOR PUBLICATION”. Suffice to say the Israelis from the start blocked the archbishop’s visit to Gaza and only at the last minute granted him a piddling 90 minutes. Was this his idea of “witnessing boldly”? The archbishop’s website joyfully reported how he hobnobbed with the Chief Rabbinate, paid his respects to Yad Vashem and the holocaust, and talked with the president of Israel – the latter no doubt sniggering up his sleeve at his guest’s frustration at being prevented by Israel’s thugs from seeing what horrors they had inflicted on the Gazans. Why did he agree to fraternize with Jewish political and religious leaders when his wish to carry out his Christian duty in Gaza was so rudely obstructed? Did Lambeth Palace not realize that meekly accepting such insults only served to legitimize the Israelis’ illegal occupation of the Palestinian territories and gave a stamp of approval to the vicious siege of Gaza, the ongoing air strikes against civilians, the persecution of Muslim and Christian communities, and the regime’s utter contempt for international law and human rights? There was no mention of a get-together with senior Islamic figures, leaving a question-mark over Williams’s real commitment to interfaith engagement. Earlier, while the Jewish state was putting its finishing touches to Operation Cast Lead (the infamous blitzkrieg launched over Christmas-New Year 2008/09 against Gaza’s civilians, including the Christian community there), the archbishop joined Chief Rabbi Jonathan Sacks in a visit to the former Nazi camps of Auschwitz-Birkenau in Poland to demonstrate their joint solidarity against the extremes of hostility and genocide. The Holy Land is the well-spring of the Christian faith, but you wouldn’t think so from the don’t-give-a-damn attitude among senior churchmen. Read the signs? Surely they were plain to see. The forces of evil had already pushed some societies into the moral cesspit. He needed to look no further than the hell-hole that the Holy Land had been turned into by the Israeli occupation, with good old England’s blessing. If ever there was a place where “the name of God was profaned” this is it. Who will step forward and save it? The Holy Land is the well-spring of the Christian faith, but you wouldn’t think so from the don’t-give-a-damn attitude among senior churchmen. Open door for the bully-boys The multitude of interfaith committees and Christian-Jewish councils has opened the door to the Zionist lobby and made it easy for them to meddle in Church business and bully Christians into submission. There’s even a propaganda outlet calling itself Anglican Friends of Israel. A few weeks ago Zionists, no doubt emboldened by the church’s appeasement policy, put the squeeze on the Bishop of Newcastle, Martin Wharton. The Representative Council of North-East Jewry wrote to him complaining that he voted for a motion at the General Synod which supported the Ecumenical Accompaniment Programme in Palestine and Israel (EAPPI) despite their “grave concerns … that it would encourage anti-Semitism”. His action, said the letter, “makes any further contact with the Jewish community in the North-East impossible”. So be it, would seem an appropriate response. But oh no. What brought this on, according to the Church Times , was Bishop Wharton’s agreement to speak at a conference, “Peace and Justice in the Holy Land”, organized by a group of people who had taken part in the EAPPI programme. Its sponsors included Christian Aid, CAFOD and Friends of Sabeel UK. The chief executive of the Council of Christians and Jews (CCJ), the Reverend David Gifford, said that the conference had “the potential of becoming yet another anti-Jewish meeting, creating more anxiety and distrust between the north-east Jewish community and the Church”. Then the Board of Deputies of British Jews chimed in saying that the EAPPI was “partisan” and “anti-Israel”. The EAPPI programme was set up by the World Council of Churches in response to a call by the churches of Jerusalem. Its mission includes engaging in public policy advocacy and standing in solidarity with the churches and all those struggling against the illegal occupation. Few people except those who support the brutal Israeli regime would disagree with the programme’s principles and objectives. And few, surely, would condemn the humanitarian work the EAPPI carries out with great courage in the face of criminal hostility. Nevertheless its success has whipped the usual suspects into an orchestrated frenzy. As reported in the Jewish Chronicle, John Dinnen, whose motion sparked the Synod debate, pointed out that well-known Jewish groups such as Jews for Justice for Palestine and the Israeli Committee Against House Demolition [ICAHD] are entirely supportive of EAPPI, and that five per cent of EAPPI volunteers are Jewish “which is a higher ratio than the number of Jews in England”. But despite having the moral high ground Wharton caved in and decided not to attend the conference “for the sake of good relations between all the faith communities in Newcastle”. The Roman Catholic Bishop of Hexham and Newcastle, Seamus Cunningham, also decided not to attend. He told the Jewish Chronicle that he had become aware “that many Jewish people in the north-east were angry and upset”. Perhaps the angry and upset should go themselves to the West Bank and experience the behaviour of their brethren towards Palestinian women and children and the EAPPI volunteers. Throughout his time on the archbishop’s throne Williams was mad-keen on interfaith dialogue, for what good it has done, and spent an inordinate amount of time with Chief Rabbi Sacks. At one point the Israeli newspaper the Jerusalem Post suggested that the chief rabbi had “in some respects eclipsed the archbishop as the religious voice of the country”. This is the UK, remember, where Jews comprise just 0.5 per cent of the population and Muslims are eight times greater in number. Nor was the Archbishop the best-known Christian, according to a survey three years ago. Harry Webb (aka Cliff Richard) beat him into second place . The survey made Cliff even “bigger than the Pope”, who trailed in seventh place. Now we hear that the squeaky-clean, born-again-Christian megastar is to perform in Israel in July, and the Israeli media are making a meal of it. Does none of these pious dudes understand the appalling, inhuman situation out there? I’m not sorry to see the back of Rowan Williams – a good guy but not the right man at this time. And what are we to make of his replacement, archbishop number 105, who will be enthroned at Canterbury Cathedral in March? Justin Welby is touted as an expert in conflict resolution, but he comes from nowhere and is not known for his concern about the Holy Land. His grandfather was a Jewish immigrant and Welby was Bishop of Durham for barely five minutes before landing this top job. The Jewish Chronicle reported that Welby last year helped mount a Holocaust Memorial Day exhibition in Liverpool Cathedral and – wait for it – abstained in last summer’s vote at the Anglican Synod which endorsed the EAPPI. In my view, anyone who cannot bring himself to give wholehearted backing to a worthy humanitarian project like EAPPI shouldn’t be leading a great Christian church. Tags: anglican church, israel and palestine, israel and palestine religion, israel and palestine religious conflict. Filed under Israel and Palestine, israel and palestine articles, israel and palestine religious conflict by Father Dave on Jan 28th, 2013. 1 Comment.